Some prayers written by Brother Alois for the midday prayer in the Church of Reconciliation are published here. Eternal God, at Christmas, by Jesus’ coming on earth, you gave humanity a new beginning. An unknown light arose, a hope of peace for the whole human family. You make this light to shine in us by your Holy Spirit, and it illuminates our darkness. You renew our wonder at your coming in our hearts. So we want to sing to you without end, while remaining close to all those who are in difficulty and suffering, and who long to see your light. Christ Jesus, today we give you thanks for the life of Brother Roger. The fire of your love burned in him – the love which gathers all people into one communion. Like him, we want to surrender ourselves to you with a trusting heart and to become women and men who are a leaven of peace. Christ Jesus, on the day of the Transfiguration we discover that if there are areas of shadow in us, there is above all in our hearts an inner light, placed there by the Holy Spirit. Christ Jesus, often we are dismayed by the violence in the world. We entrust to you the victims in Munich and their families as they grieve. Give the consolation of the Holy Spirit to those who are in despair and help us to be witnesses of hope to those around us. God of compassion, we entrust to you the victims of the attack in Nice and their families as they mourn. The violence and hate unleashed in the world dismay us. So we turn to you, who are close to every person even after their death. Help us to show by the lives we live that you are the God of peace. Holy Spirit, Comforter, on this day of Pentecost we celebrate your presence. As Jesus promised, you give us the joy which endures deep within, a joy which carries us even in times of trial. You do not impose, you come to strengthen us, defending the dignity of each person. And in our great diversity it is in you that we find unity and peace. Christ Jesus, you died on the cross, but you are risen and alive today. For all of us you prepare a place with God. We rely on your presence, which is now invisible. You told us: “I am with you always, until the end of time.” May this hope of the Gospel spread out to all people! Christ Jesus, you call us to take the risk of trusting and to believe without having seen. Praised be you for the Orthodox Christians who celebrate Easter today. 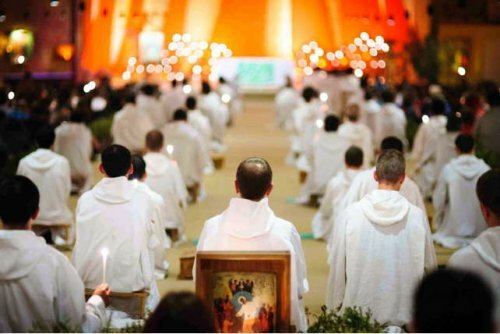 To be able to believe in you we are not alone: you give us the wide communion of your Church. Christ Jesus, you washed the feet of your disciples for us to know that we are loved by God, and so that we might love one another. By your Eucharist you gather us into one body. Together with you nothing can separate us from God’s love. Christ Jesus, in your life hatred and death did not have the last word. You are risen. Even though invisible to our eyes, you are present for every human being. Your Holy Spirit brings to birth in us the courage of mercy for those who are nearby as well as for those who are far away. In a world where we are often disconcerted by violence, you enable us to hope against all hope. God of compassion, you remain close to those who suffer the cruelty of human violence. We entrust to you the victims of the bomb attacks in Brussels and their families. In the face of the incomprehensible suffering of innocent people, we believe that the words of Jesus, words of love and of hope, will never pass away. So we implore you: grant your peace, may your kingdom come. Christ Jesus, you came to save us from evil and death, and great is our joy today when we see with what simplicity you entered Jerusalem to finish your mission. You became one of us, sharing our suffering and becoming close to those who experience violence in so many places in the world. We put our trust in you. God, you love every person. In receiving the ashes, we acknowledge how fragile our existence is. May our path towards Easter deepen our trust that our lives are in your hands and that you are nothing but forgiveness and love. During the next song we shall make the sign of the cross in the palm of the hand of those sitting around us. Accept this sign, living God, which expresses our desire to live in your forgiveness day by day, so that your peace may shine out in our midst. Be praised, Christ Jesus, for all the peoples whom you gather in one communion, the Church, which is your Body. It fortifies our hope that you are renewing the face of the earth. At this time of great upheavals, when conflicts and the menace of violence are rife, kindle in us a passion for communion so that your work of peace may shine out across the world. Eternal God, you are beyond everything that we can imagine and yet you came on the earth as a child. Allow us to see in the poor and vulnerable a reflection of your love. We pray to you for the Christians of Churches which celebrate Christmas today. God of all kindness, we thank you for the beautiful meeting which we had in Valencia. We entrust to your care the young participants, the families which welcomed them in the parishes. May the meeting bear fruit in peace and mercy. God of goodness, at Christmas we remember that you sent Jesus into the world to bear witness to your infinite mercy. The violence of the world was unleashed against him, but it could not overcome your love. Stay close, today, to the countless victims of human violence; may faces expressing compassion be for them reflections of your presence. Show us how we can contribute without delay, both near at hand and far away, to the shining forth of your peace amidst humanity and in the whole creation. Eternal God, we want our thoughts and acts to be based on your presence which is the source of our hope. We entrust to you the victims of the attacks in Paris and in Beirut, and their families and friends as they mourn. With believers of all backgrounds we call upon your name and pray: may your peace come to our world. God of love, as we remain in your presence you allow us to glimpse the beauty of what you have created, of all that comes from you, and of your inexhaustible compassion. You strengthen our consideration of others and of all creation. Help us discover the value of all things and make of us bearers of your peace to the whole human family. God of compassion, we thank you for Brother Roger’s life, given for others. We praise you for the witness he gave to the Risen Christ and for his faithfulness until death. In a world often torn by violence, he wanted to create a community that is a parable of communion, and we thank you for the first companions who joined him. To relieve suffering, to welcome, to listen in order to understand everything of the others: that is the path you opened for him. He eagerly sought to express by his life your infinite goodness for every human being, whether believers or non-believers. Poor and vulnerable as he was himself, with all his strength he chose to love. He loved your Church. May his witness to an ecumenism of holiness inspire us. Send us your Holy Spirit, to make us creators of unity among Christians when they separate, bearers of peace among human beings when they are in opposition. Enable us to find ways of living in solidarity with the poor, near or far. Renew us in our joy, the joy of brotherly love. Renew us in our simplicity of heart. Grant us the freshness of mind to understand your Gospel over and over again. Renew us in mercy so that every day we are ready to forgive, without ever expecting anything in return. In communion with those who have gone before us in faith, from the apostles and the Virgin Mary, we would like to sing with Brother Roger: Happy who surrenders to you, O God, with trusting hearts. You keep us in joy, simplicity, and mercy. Christ Jesus, on the Day of Ascension you help us understand that you never abandon us; you send a strength from above, your Holy Spirit. And the presence of the Spirit opens us to joy and praise. Christ Jesus, as Thomas the Apostle did, we at times can doubt in your resurrection. You call us then to take the risk of trusting, to believe without seeing. Praised be you for the communion of all believers, and for the Orthodox Christians who celebrate Easter today. For us to believe in you, you grant us the great communion of your Church. Jesus, our peace, on the cross you stretched out your arms to the universe. On Easter morning you rose from the dead to gather all human beings together in God. You do away with all separation. By giving your life for love you became the wellspring of a new creation. Even though invisible, by the Holy Spirit you are close to each one of us. Like you, we want to choose to love. This prayer is often inspired by the Bible reading for the midday prayer, which is also published online.